The only thing better then an excellent beer recipe, is a good set of instructions on how to make that recipe. This is illustrated by the fact that you can give the exact same recipe to two different brewers and get two different beers. The reason for this, is that over time a brewer develops his own bag of tricks or techniques. These may be simple sanitation methods or more elaborate mashing procedures. 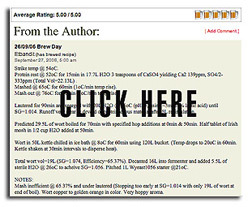 The recipe database here at BeerTools was designed with that simple fact in mind. Recipes are great, recipes with comments and feedback are even better! We added the comment feature to the recipe database back in 2001. The result is a wealth of recipe wisdom. A casual look through the nearly 5,500 recipes will reveal insightful comments about what went right or wrong in a recipe. Some authors keep their brewing notes right here in the database. Combine the database with the forum here at BeerTools, and you have a powerful bag of tricks of your own! So whether you are a new brewer or a long time brewer keeping good records is critical. 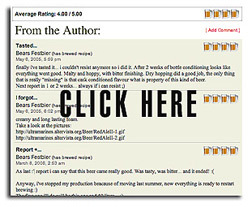 Posting feedback and comments to the recipes here at BeerTools helps everyone improve.